Tom directed his first feature – Tiger House – which was released internationally in 2015. Tom was producer on MGM’s OPERATION FINALE from his original idea. He is developing a small slate of TV and Film ideas. Tom studied English Literature at Edinburgh University. Tom started his career as an Assistant Director at the Royal Shakespeare Company and was then the recipient of the Bulldog Bursary as Director-on Attachment at the Royal National Theatre. Tom’s short film credits include The Rules of the Game – which was a finalist in the online Cannes Short Film Corner 2009, nominated for Best UK Short at Raindance 2009 and was in the official selection in the Montreal Film Festival 2009. Most recently he has directed Pork for the UK Film Council and the teaser for Tiger House starring James Purefoy. Tom directs the voice work in major Computer Game titles at Side. Credits include Goldeneye, Kinect Sports (Best Family Game, BAFTA 2011) and Shogun 2 (Best Strategy Game, BAFTA 2012). 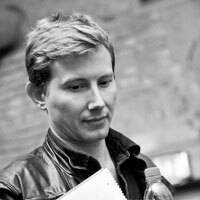 Tom’s Directing credits in theatre include The Pride (Beme Theatre, Munich and Koninklijke Schouwburg, The Hague), After Miss Julie (Salisbury Playhouse), The Rise and Fall of Little Voice and Rope (Watermill Theatre), Invisible Mountains (Royal National Theatre), The School of Night (Royal Shakespeare Company), The Ash Girl (RADA), Plenty, The Blue Room, Macbeth and Coriolanus (Guildhall), Casanova and Splendour (RWCMD) and The Possibilities (Rose Bruford). Tom has worked as an Assistant Director at the Royal Exchange Theatre, Chichester Festival Theatre, Barbican Theatre and Citizens Theatre. He has worked as an Associate Director at the Royal National Theatre (UK Tour) and with Propeller Theatre Company (World Tour). Opera Directing credits include Rusalka for English Touring Opera. Tom runs his own Drama School and sits on the audition panel at the Guildhall School of Music and Drama.